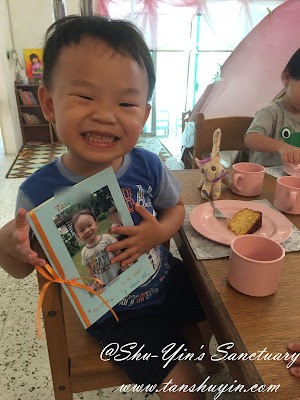 My little boy turned 3 on 14 September 2015. 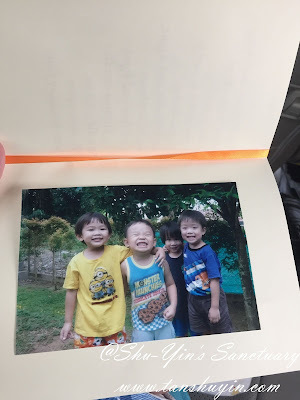 I wrote him a short little message on Facebook so that he can read it when he grows up. 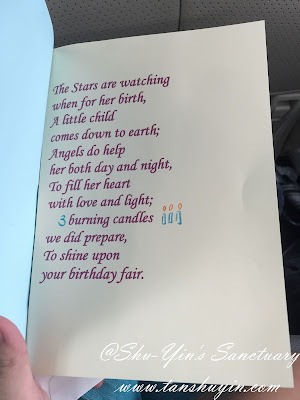 You are turning 3 tomorrow. What a big difference of behaviour at this year's party compared to last year. Last year, you were still having strangers anxiety. This year, you basked in and enjoyed yourself to the max. Just look at your smile. You were an easy baby and it was such joy to raise you up. 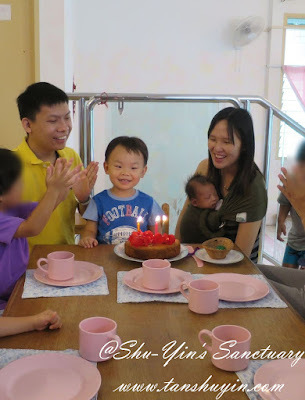 You are an easily contented baby and toddler and made everyone happy with your easy style. Nevertheless there were also worrying times when you were sick during your 1st year, and when you refused to take solid. But luckily you turn out ok now! As usual, you are such an appreciative child, claiming 'it's wonderful!' the moment you saw the desert table and your cake. And told me 'it's delicious' when you bit into the cake! Through you, I learned that not all kids are monsters. You are a happy baby and you are the sunshine in our home. Thank you for choosing us as your mum & dad. Happy birthday my dearest khye-khye! He was very excited to be able to celebrate his birthday in school. At 3 yo, he was finally big enough to understand what is a birthday celebration. 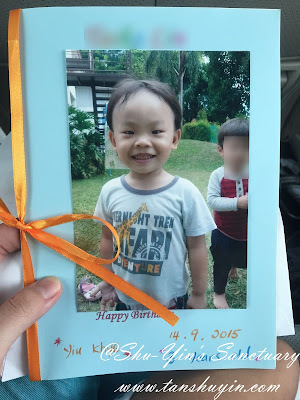 His school had just some simple requests for his birthday celebration. 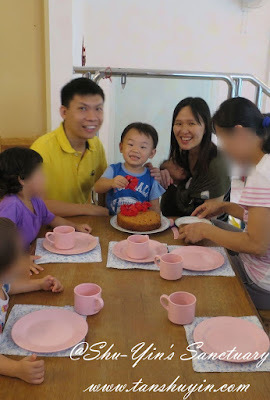 - No need to bring cake as the playschool will bake the cake for them. - If wish to, just bring some fruits. 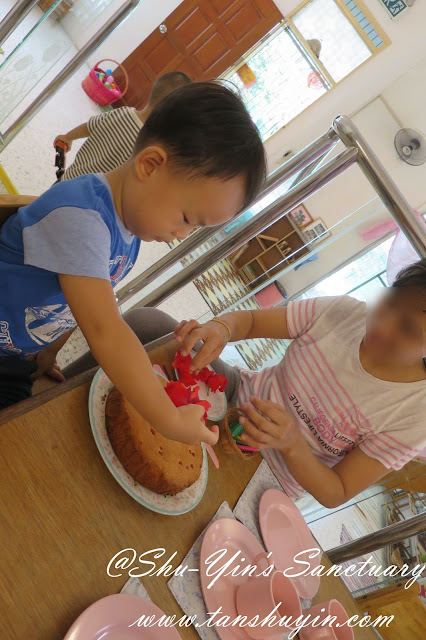 They baked a simple butter cake and then picked some nice hibiscus from the school garden for Khye to decorate on the cake. Talk about simplicity! 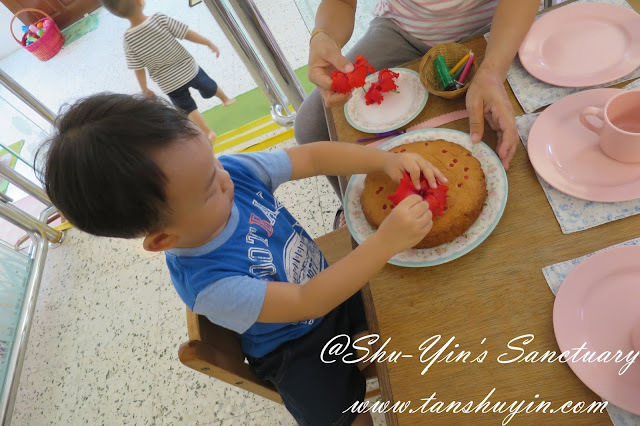 Khye had fun decorating his cake with his 3 hibiscus and 3 candles! Then we sang the birthday song for Khye. He sat there smiling happily while all of us sang him the birthday song. 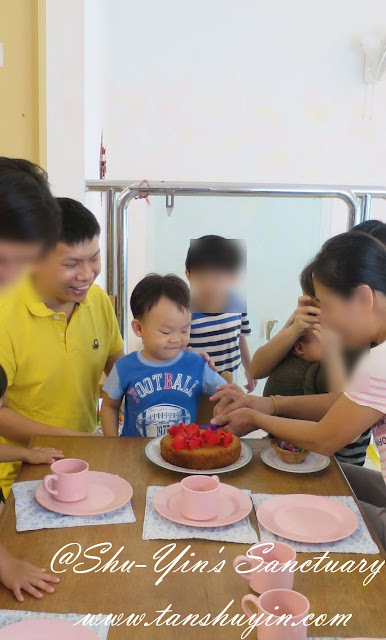 After that, he blew the candles and cut his own cake. 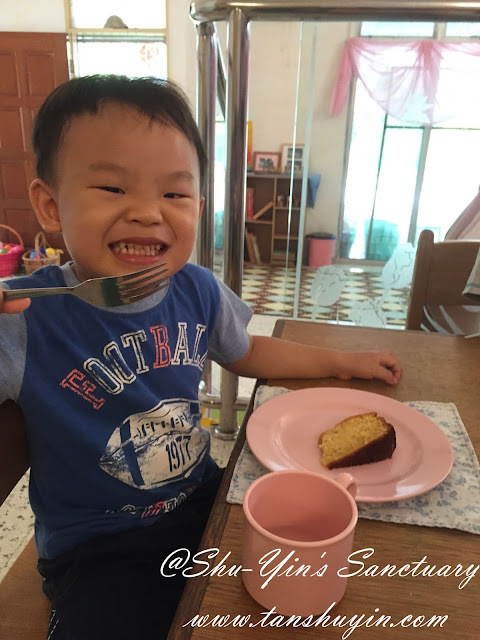 Khye happily eating his cake and the fruits I brought there. 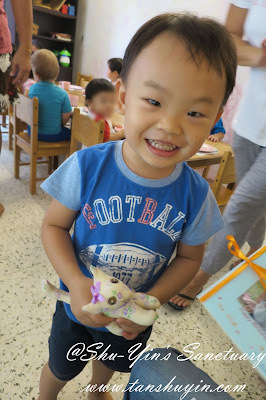 He received a handmade cat and a little booklet/card from the school. It now stands on the mantelpiece in our house. 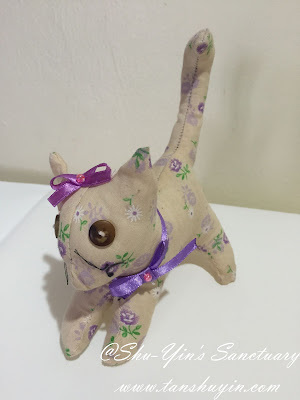 And the handmade cat is lovely as well. It is now Khye's most prized possession. Just 1 week+ and the cat is now a little raggedy! Khye is so blessed to be part of this school. 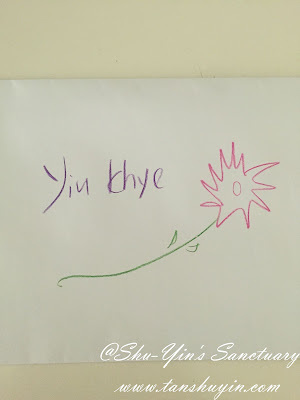 Thank you for making Yiu-Khye soo happy! 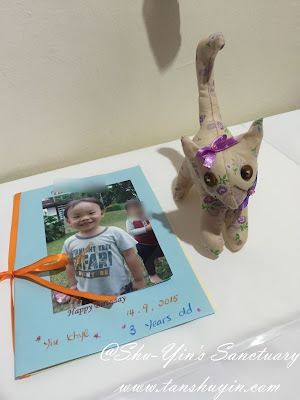 p/s - Click here to read about Khye's 3rd Alphabet Party at Home.